Rapid brain growth; head size increases. 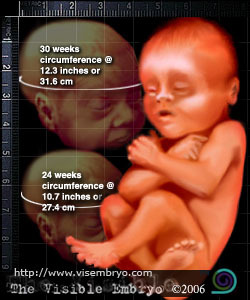 Fetal size: weight about 3 pounds (1.35kg). Its crown-to-rump length is a little over 10.8 inches (27cm), and total length is 17 inches (38cm). Mother's size: the uterus is about 4 inches above the bellybutton. From the pubic symphysis, the top of your uterus measures about 12 inches (30cm). Rapid brain growth continues and head size increases as the growing brain pushes the skull outward creating more surface convolutions. This quick growth increases the number of interconnections between individual nerve cells. The iris is colored and the pupil reflexes responding to light. Head hair grows thicker. Toenails are fully formed. Because of the lack of space in the uterus, the legs are drawn up in what is known as the fetal position.